You see in the beehive, the worker bees obtain energy and nutrition from honey. But they also secrete a food that they give the queen bees, and to larvae that may turn into queen bees. That food is royal jelly! Royal jelly is a thick and milky-white substance that is secreted from the glands of honeybees. It consists of protein, water, amino acids, fatty acids, minerals, vitamins, and sugars. It is a great food for the queen bee because they require more nutrition than other bees. Royal jelly is the reason that queen bees live so long, and it also why they get so big and strong. Interestingly, the lifespan of queen bees is seven years, compared to just seven weeks of the workers. Royal jelly is also incredibly powerful for humans. Research shows the effectiveness of the jelly for anxiety, asthma, insomnia, tiredness, heart disease, gout, hepatitis, sexual performance, cancer, and much more. This article delves into royal jelly, as well as the benefits of this powerful bee product. Royal jelly contains three to six percent of fats; two to three percent vitamins, salts, and amino acids; 10% to 16% sugar; 12% to 15% proteins; and about 60% to 70% water. Some of the powerful nutrients in the jelly include biotin, vitamin B5 and other B vitamins, gamma globulin, nucleic acids, folate, inositol, and 17 different amino acids. It also contains magnesium, potassium, copper, calcium, zinc, iron, manganese, and sulfur. The composition of royal jelly largely depends on the climate and geography of the honeybees. It also possesses various beneficial properties, including antibacterial, antioxidant, antitumor, and immune-enhancing effects. Honeybee (Apis mellifera) royal jelly also contains lipids, a class of organic compounds that are mostly medium-chain fatty acids. The lipids prevent and support the immune system, skin health, and menopause. They also inhibit the growth of cancer. For thousands of years, the powerful properties of royal jelly has been an interest for people. In fact, the ancient Egyptians used it to keep their skin glowing, while it was even used to preserve mummies. Royal jelly was even featured in a Roald Dahl novel about a beekeeper and his wife that are worried about their newborn daughter not getting proper nutrition. The child only starts to thrive after the beekeeper gives her royal jelly. Today, royal jelly is used in various skin care products and creams for the prevention of ageing skin and wrinkles. It is also a very beneficial as a medicine. The following are 10 health benefits of royal jelly that will make you consider taking it. Royal jelly has shown great promise for fighting infection and treating wounds. A study published in Nutrition Research and Practice in 2010 found that the jelly boosts production of skin cells that repair damaged tissue in diabetic mice with wounds. Ultimately, the research discovered that royal jelly enhances fibroblast migration, which is a cell found in connective tissue that produces collagen and other beneficial fibers. Fibroblasts will alter the levels of lipids involved in wound healing. 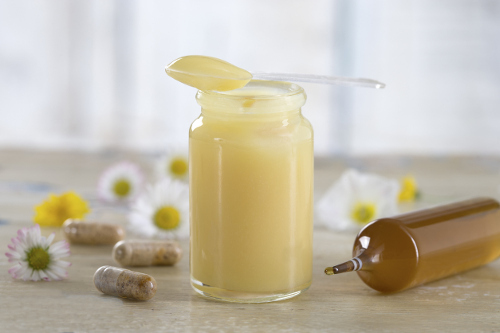 Royal jelly is a great supplement for boosting immunity. Various studies have confirmed its anti-inflammatory and antibacterial properties, including one from 2015 published in the journal, PLOS One. It has also been found to decrease pain and inflammation in the digestive tract of cancer patients when given prior to radiation and chemotherapy. It also boosts immunity and reduces fatigue in cancer patients after two and four weeks of treatment. Royal jelly may be helpful for women with premenstrual syndrome (PMS). For instance, medical students from Iran saw a significant reduction in PMS symptoms when a royal jelly pill was taken for two consecutive menstrual cycles. Some animal studies have also suggested that the jelly may help increase fertilization in women struggling with infertility. Another study published in the Journal of Clinical and Diagnostic Research in 2016 found that a vaginal royal jelly cream improved sexual and urinary function, and the quality of life in women between 50 and 65 years of age. Postmenopausal women often experience urinary incontinence, sexual issues, and stress. Royal jelly is also a valuable source of the probiotic bifidobacteria. It is this beneficial bacteria that supports digestive health and the gastrointestinal tract. The presence of bifidobacteria in the GI tract also contains anticarcinogenic and immune-enhancing abilities. As mentioned, royal jelly is great for skin health. A study published in the Journal of Medicinal Food in 2012 found that it may protect against ageing skin through the enhancement of collagen production. For the study, the level of procollagen type 1 protein was increased in rats fed a supplement with one percent royal jelly extract. In a study published in the journal, Joint Diseases and Related Surgery in 2012, Turkish researchers found significant results with royal jelly on bone health in the proximal femur and lumbar spine. Also, bone tissue phosphate and calcium levels were higher, which suggests that it may lower bone loss due to osteoporosis. Studies also suggest that royal jelly may improve certain type 2 diabetes markers. A double-blind, placebo-controlled study published in the Canadian Journal of Diabetes in 2016 found that 1,000 milligrams three times daily of the jelly significantly reduced blood sugar levels in type 2 diabetics. Other research suggest that it improves insulin resistance and antioxidant levels in diabetics aged 25 to 65. A study published in the Avicenna Journal of Phytomedicine in 2014 suggested that royal jelly can improve male fertility. The researchers evaluated the protective effect of royal jelly on testosterone levels and sperm parameters. Sperm motility and sperm count, as well as the maturity, viability, and DNA integrity were all examined in the study. Royal jelly may improve short-term memory due to its beneficial role on neural functions. In a study published in Advanced Biomedical Research in 2012, researchers supported the potential neuro-protective role of royal jelly, and its helpful effects in Alzheimer’s disease. The antioxidant substances in royal jelly play a preventative and curative role in neurodegenerative diseases like Alzheimer’s disease. The mucous membrane is the soft tissue layer that lines the digestive system. Mucositis is a condition that produces pain and mucous membrane inflammation—a common side effect of chemotherapy, and sometimes radiotherapy. Studies show that royal jelly can improve the healing time in patients receiving chemotherapy and radiotherapy. Data also suggests that royal jelly-containing substances effectively heals severe oral mucositis due to its antioxidant and anti-inflammatory effects. Royal jelly is a dry, slightly bitter astringent, and leaves an aftertaste. It is very potent, and therefore, only half a teaspoon is needed to achieve its many benefits. How do you use royal jelly? You can put some in your tea or morning smoothie, eat it raw, or even combine it with honey and use it as a spread. You can purchase royal jelly from local health food stores. When royal jelly is made into capsules or tablets, it is often mixed with fillers, which means reading the labels is important. There is also freeze-dried royal jelly for people that don’t intend on using it that often. The freeze-dried product is more shelf-stable, and will maintain most benefits when stored at room temperature. When using non-freeze-dried royal jelly, choose one that was previously frozen because it maintains its quality better than storing it at room temperature or refrigerating it. Liquid royal jelly is also available; however, it does contain some honey and preservatives to improve flavor. Although royal jelly benefits nearly everyone, there are some precautions to keep in mind. People with estrogen receptor-positive breast cancer should avoid royal jelly due to its ability to stimulate cancer cell growth. You should also consult with your doctor before taking royal jelly if you are pregnant, breastfeeding, or take blood thinners or other medication. There have also been cases of asthma, hemorrhagic colitis, and anaphylaxis linked to the use of royal jelly. People severely allergic to bee venom should also avoid royal jelly. There is not enough scientific research to determine an appropriate range of dose for royal jelly, and the best dosage depends on factors, such as health, age, and other conditions. Be sure to consult your natural doctor before using royal jelly, and follow the directions on the label. Will royal jelly be your next bee product? Honey is used a natural sweetener, where royal jelly, bee pollen, and bee propolis are among the products used as supplements. Also, it is important not to confuse royal jelly with bee venom or bee pollen, as they are very different bee products. Royal jelly in particular, is used for arthritis pain, collagen levels and tone of skin, Alzheimer’s disease, immunity, osteoporosis, wound healing, menopausal and postmenopausal, diabetes, and male fertility. “8 Wonderful Benefits of Royal Jelly,” Organic Facts; https://www.organicfacts.net/health-benefits/animal-product/royal-jelly.html, last accessed March 29, 2017. Moore, E., “What Are The Health Benefits of Royal Jelly?” Healthline, October 20, 2016; http://www.healthline.com/health/food-nutrition/royal-jelly-benefits. Morita, H., “Effect of royal jelly ingestion for six months on health volunteers,” Nutrition Journal, 2012: 11:77, doi: 10.1186/1475-2891-11-77. “Why Royal Jelly is So Extraordinary,” Benefits of Honey; http://www.benefits-of-honey.com/royal-jelly.html, last accessed March 29, 2017. “Royal jelly makes one live longer: Why queen bees survive 40-times longer than workers,” Daily Mail Online, April 25, 2011; http://www.dailymail.co.uk/sciencetech/article-1380138/Royal-jelly-makes-live-longer-Why-queen-bees-survive-40-times-longer-workers.html. “Mucositis,” NHS Choices, December 19, 2014; http://www.nhs.uk/conditions/mucositis/Pages/Introduction.aspx, last accessed March 29, 2017. Kim, J., “Royal jelly enhances migration of human dermal fibroblasts and alters the levels of cholesterol and sphinganine in an in vitro wound healing model,” Nutrition Research Practice, October 2010; 4(5): 362-368, doi: 10.4162/nrp.2010.4.5.362. Khosphpey, B., “Effect or Royal Jelly Intake on Serum Glucose, Apolipoprotein A-I (ApoA-I), Apolipoprotein B (ApoB) and ApoB/ApoA-I Ratios in Patients with Type 2 Diabetes: A Randomized, Double-Blind Clinical Trial Study,” Canadian Journal of Diabetes, August 2016; 40(4): 324-238, doi: 10.1016/jcjd.2016.01.003. Shidfar, F., “Does Supplementation with Royal Jelly Improve Oxidative Stress and Insulin Resistance in Type 2 Diabetic Patients?” Iranian Journal Public Health, June 2015; 44(6): 797-803. https://www.ncbi.nlm.nih.gov/pubmed/26258092. Zahmatkesh, E. et al., “Protective effect of royal jelly on the sperm parameters and testosterone level and lipid peroxidation in adult mice treated with oxymetholone,” Avicenna Journal of Phytomedicine, January 2014; 4(1): 43-52. https://www.ncbi.nlm.nih.gov/pubmed/25050300. Zamani, Z. et al., “Effect of Royal Jelly on spatial learning and memory in rat model of streptozotocin-induced sporadic Alzheimer’s disease,” Advanced Biomedical Research, 2012; 1: 26, doi: 10.4103/2277-9175.98150. Brudzynski, K. et al., “Honey Glycoproteins containing antimicrobial peptides, Jelleins of the Major Royal Jelly Protein 1, are responsible for the cell wall lytic and bactericidal activities of honey,” PLOS One, April 1, 2015; 10(4): e0120238, doi: 10.1371/joural.pone.0120238. Seyyedi, F. et al., “Comparison of the Effects of Vaginal Royal Jelly and Vaginal Estrogen on Quality of Life, Sexual and Urinary Function in Postmenopausal Women,” Journal of Clinical and Diagnostic Research, May 2016; 10(5): QCO1-5, doi: 10.7860/JCDR/2016/17844.7715. Kafadar, I.H. et al., “Royal jelly and bee pollen decrease bone loss due to osteoporosis in an oophorectomized rat model,” Joint Diseases and Related Surgery, 2012; 23(2): 100-105. https://www.ncbi.nlm.nih.gov/pubmed/22765489. Park, H.M. et al., “Royal jelly increases collagen production in rat skin after ovariectomy,” Journal of Medicinal Food, June 2012; 15(6): 568-575, doi: 10.1089/jmf.2011.1888.